Chiropractic is a greek term meaning “done by hand”: In chiropractic, we are interested in looking for the root or source of your health problems (instead of just masking or treating symptoms) so you get well and stay well. By optimizing the mobility and alignment of your spine and extremities, chiropractors help optimize function of your brain and nerves. A healthy spine and nervous system is vital for you to live pain free, with strength, energy, and clear focus. Are motivated to continue to fine tune their diet and lifestyle behaviours in the long run to optimize their health and performance. Think of us as trying to put together a puzzle picture of a healthy you. Happy, full of energy, focussed, clear, on purpose, strong, healthy body weight, and productive. Our job is to find the missing puzzle pieces that are preventing you from obtaining that perfect picture of health and put them together to complete your picture. Maybe you are missing the healthy immune system piece, the healthy digestive system piece, or the healthy brain and nervous system piece. Often it’s more than one piece that you are missing. All of these pieces have to connect directly or indirectly together to complete your “whole” health picture. So how do we find them? We search for them by looking for unhealthy pieces. With chiropractic care we are focussed on finding the unhealthy brain and nervous system piece. We use a variety of tools to do this: posture check, range of motion, strength/muscle testing (applied kinesiology), orthopaedic and neurological tests, palpatory assessment, and sometimes x-rays. This approach allows us to find out if the spine and nervous system are contributing to your health problem(s). Poor posture, poor alignment, and poor mobility of the spine and extremities results in poor brain and nerve function. As a result your health declines. By correcting the alignment and mobility of your spine and extremities we can strengthen your brain, nervous system, and muscles. We do this by using adjustments (push or pull specific areas of the spine or extremities) and muscle therapy. The health of the brain and nervous system are also influenced by your diet, mental stress, prolonged sitting, lack of exercise or too much exercise, infections, and environmental toxins. So sometimes we have to take a more holistic approach and use nutritional therapy, herbal medicine, supplements, stress management, detoxification, and lifestyle changes. 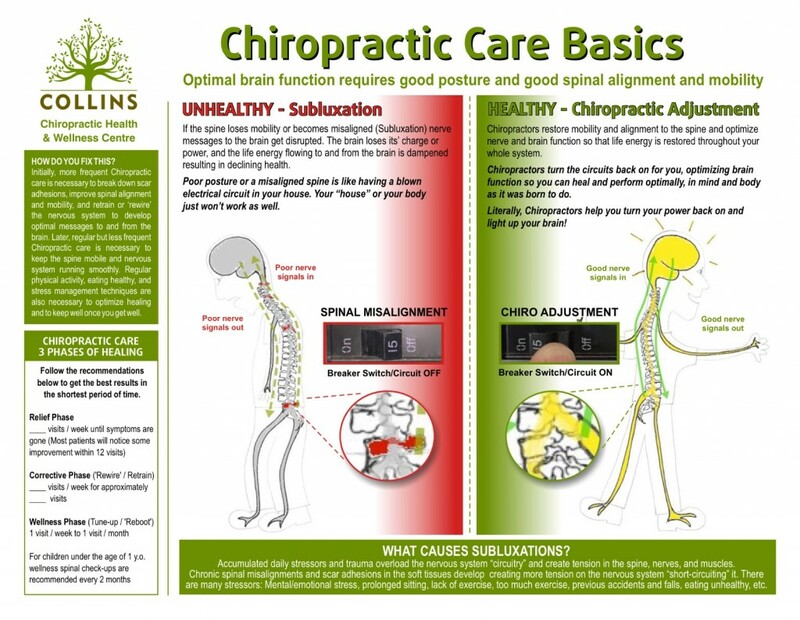 By understanding how all of the pieces and systems of your body are interconnected, and how their function can be restored or “rebuilt”, many chronic health problems can be prevented and even reversed. When you approaching your health problems in this way, you can help rebuild yourself so you are the perfect picture of health. Dr. Collins focuses on restoring mobility, alignment, and strength to the spine, extremities and nervous system. Investigative. Addresses the master control system of the body, the brain and nervous system, as one of the root causes of your health problem(s) which leads to optimal healing and long lasting results. Holistic. Understands the systems and parts of the body and our environment are all interconnected and recognizes the importance of theses connections in health and disease. Safe. Treatments have mild or no side effects, and other “untreated” complaints often improve. Patient-centered. Treats the patient, not the disease. Treatments are highly individualized based on the patient’s needs. Not a “cookie cutter” plan. Participatory. Patients are educated, empowered, and encouraged to take an active role in their healing process. Integrative. Multiple treatment approaches are often used and emphasizes importance of diet and lifestyle. Restorative. Tests and treatments are designed to zero in on the underlying problem and optimize function, prevent and reverse disease, and improve the quality of your life. Preventative. Treatments always entail that you engage in lifestyle and dietary changes that will help prevent chronic illness. Conventional medicine will have a specialist for each body part: cardiologists for the heart, podiatrists for the feet, dermatologists for the skin, gastroenterologists for the digestive system, and neurologists for the brain and nervous system. But in chiropractic we see all body parts as an interconnected whole, within a larger environment. So when we treat the spine, brain, nervous system we understand that it will have an effect on all of the other parts of the body.